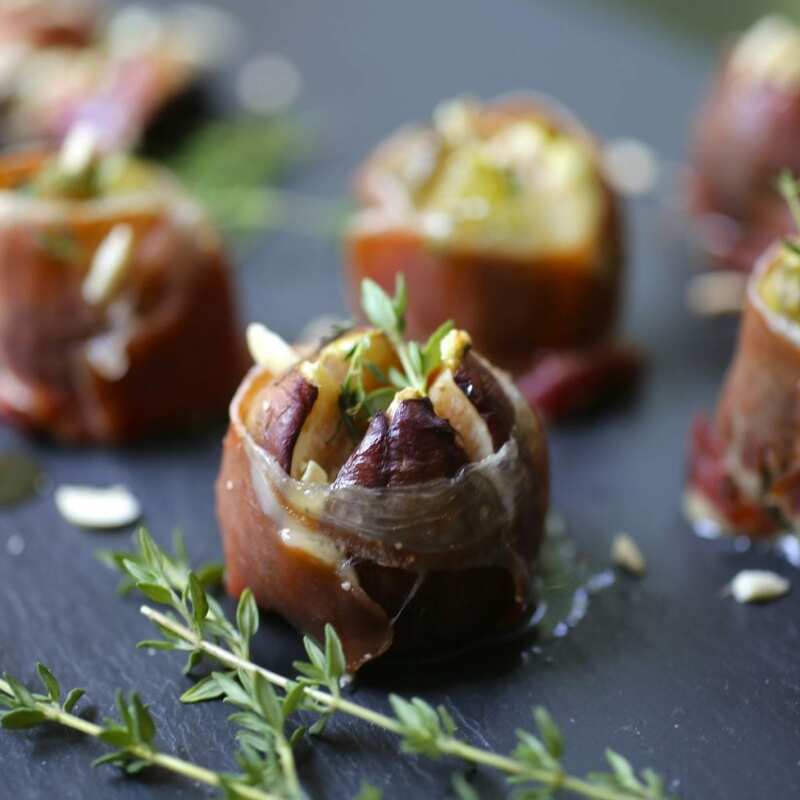 An easy and elegant appetizer of roasted figs stuffed with blue cheese, wrapped in Serrano ham. Finished with fresh thyme, a drizzle of honey, and a few toasted almonds. I know, I know, you’re thinking,”Emily, when did you become a member of the Royal Family cos, gurl, you fancy!” (I apologize for making you sound like a 1970’s sit-com character, but it was required for comedy purposes. You should see the wig I’m imagining on you). 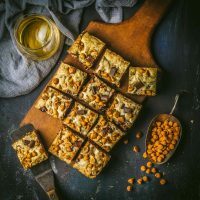 Yes, it’s true that these beauties would be perfect alongside a glass of Champagne at an elegant cocktail party. But, truth be told, they’d be equally delightful with a (not terribly expensive) glass of rosé while sitting on the back deck. Guess which way we had them? (If you guessed “directly off the baking tray, standing in the kitchen with a dog and two cats staring at us”, you would be correct). As fancy as they look, these are incredibly easy to make. On the preparing-for-a-party difficulty scale, they fall slightly above “pour potato chips into bowl” and well below “make homemade dip”. The hardest part is finding fresh figs, which isn’t very hard when they’re in season. 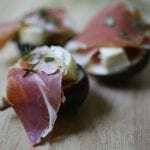 If your figs are very ripe, you don’t even really need to roast them (but I find the combination of a warm, jammy fig, oozy sharp cheese, and salty ham to be irresistible). If you’re making them for a party. you could prep them up to a day ahead and just roast them a few minutes before you want to serve them. Ripe figs are so lovely, aren’t they? 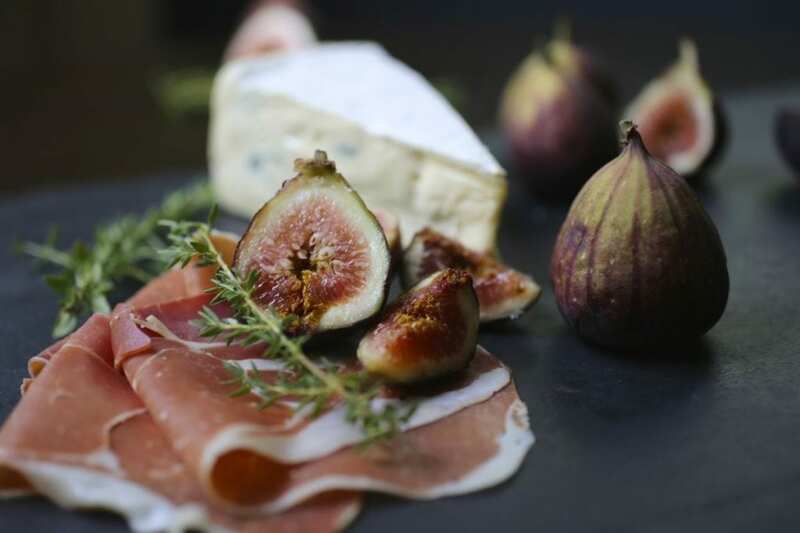 Cheese, figs, ham. Easy peasy. CH-easy peasy. Figgy pig…I’d better stop now. Fill fig with a bit of Bleu (or your favorite) cheese. Top with a few leaves of thyme. You could also split the figs and simply top them. After roasting, drizzle with honey and top with slivered almonds. I love the combination with bleu cheese, but fresh goat or fontina would work too. 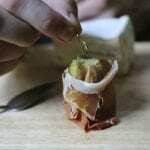 Serrano and prosciutto both work well so use your favorite. 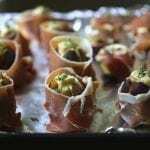 If you want smaller bites (or want to stretch your ingredients), instead of filling the figs, cut them in half and top each half with a bit of cheese and a drape of ham. Cut the roasting time to 7-10 minutes. These are also DELICIOUS served on lightly dressed arugula as a salad or starter. Heat your oven to 375F (200C). 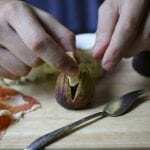 Using a sharp knife, cut off the stems of the figs. Then cut an X into the stem side about ¾ of the way (don't cut all the way down or the figs might fall apart). Use your finger to open them up just a little. 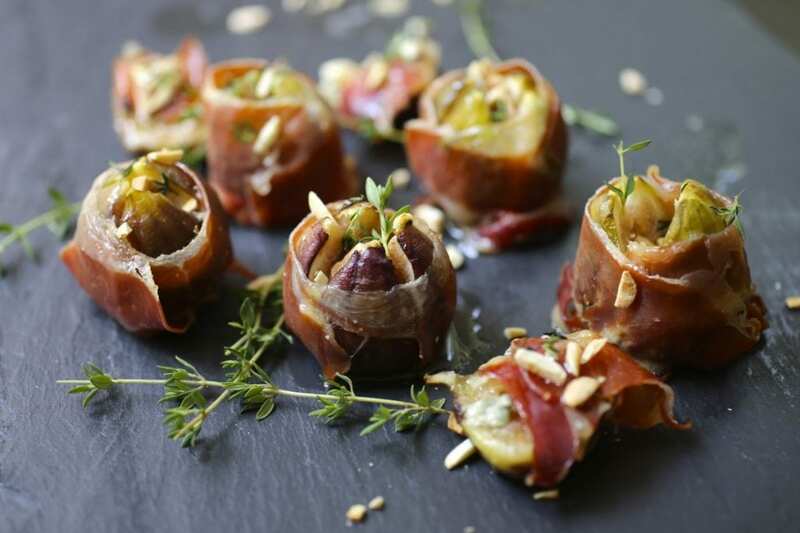 Drop about a ½ teaspoon of cheese into each fig and wrap a strip of ham around the bottom half (leaving a bit of the pretty top half poking though). Line a baking sheet with parchment or foil (or use a silpat), and arrange the figs on it, leaving a bit of room between them. 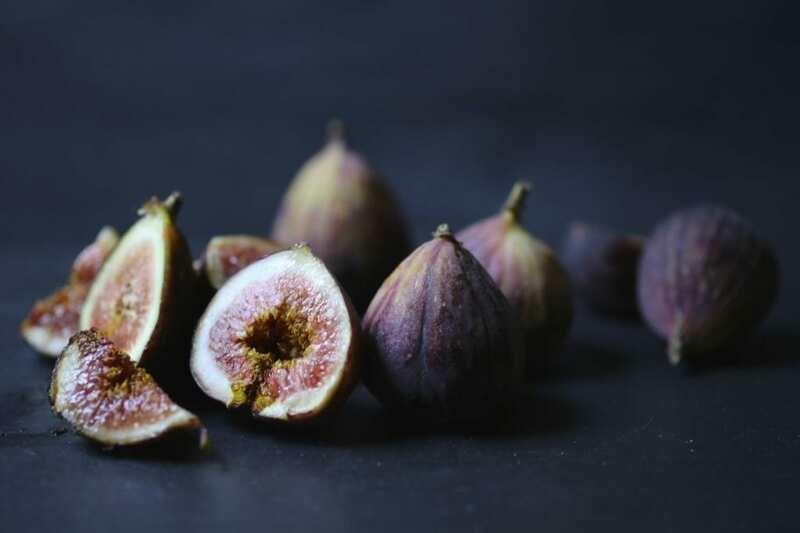 Sprinkle a bit of thyme and a cracked pepper on each fig. 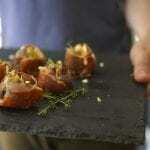 Roast for about 8 to 12 minutes until the figs soften, the cheese melts and the ham becomes lightly brown. 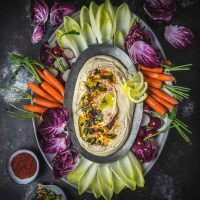 Arrange them on a platter and drizzle them with a little bit of honey and a sprinkle of almonds. 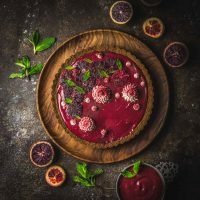 Such a creative recipe!! Love this idea! Wonder how good it must have tasted! It was SO GOOD. Very easy to make so will probably make it again this summer. Hope I can still find figs! I am experiencing a rush of love and hate. Love you for sharing, hate that I don’t have a plate of these in front of me RIGHT NOW. 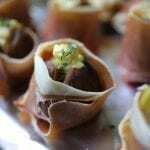 I have figs in my fridge right now, as well as goat cheese and Canadian bacon, wondering if I can make this fancy recipe’s less posh cousin. Ha, THAT is a conundrum! 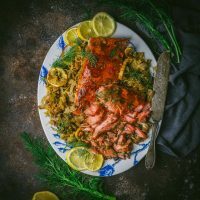 If the Canadian bacon is too thick to wrap, you could cut it into thin strips, fry until crispy and top the halved figs with the cheese and a few strips of the bacon. Sounds good to me! Mmm I once made something similar but wrapped with thinly shaved honey maple turkey breast lunch meat style and goat cheese with thin sliced peaches and thyme! !